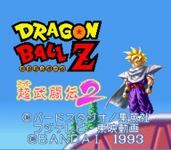 "Dragon Ball Z: Super Butōden 2 (ドラゴンボールZ 超武闘伝2 Doragon Bōru Zetto Sūpā Butōden Tsū?, Dragon Ball Z: Super Fighting Story 2), called Dragon Ball Z 2: la Légende Saien in France, is the second installment in the Super Butōden series. The game was released in Japan on December 17, 1993 and in France and Spain in 1994. Super Butōden 2 features 10 playable characters (8 normal, 2 unlockable with a code) and its story mode covers the Cell Games, as well as several stories involving Bojack, Zangya, and Broli completely unrelated to the movies they hail from. For unknown reasons, these three characters were renamed Kujila, Aki, and Tara in the French version, respectively. Depending on if the player wins or loses a battle, the story will take a different turn in the Story Mode, which leads to a lot of possibilities to experience. This is the only Dragon Ball Z fighting game in which Goku is not readily playable. A code is required to unlock him and Broly, the other hidden character." Source: Wikipedia, "List_of_Dragon_Ball_video_games," available under the CC-BY-SA License.